Whithout a doubt, the 1000 year old capital should be on every visitor's agenda. It lies roughly in the centre of the island, within easy reach of the other towns and a day in Lefkosia will be a day well spent. The old walled city is unique and definitely the place to head for first. Encircled by strong fortress walls built by the Venetians in the 16th century, the enchanting old city is scattered with buildings and monuments of historical interest as well as little shops, cafes and tavernas. The Lefkosia jewellery Museum, the Museum of the History of the Cypriot Coinage and the Municipal Arts Centre, are all worth a visit. The Leventis Municipal Museum of Lefkosia, with an imaginative presentation of the capital's history, was awarded the title "1991 European Museum of the Year". To walk through the old city is to step backwards in time. Narrow streets and old houses with ornate balconies jut from weatherbeaten sandstone walls, and craftsmen in small workshops practise trades unchanged for centuries. "Laiki Geitonia" - Folk Neighbourhood - is a pedestrian section which has been carefully renovated to evoke the atmosphere of past days. The two main streets of Old Nicosia, Lidra and Onasagorou, are lined with shops of every type, and both streets are pedestrian-only. Not to be missed, is the unique Cyprus Museum, housing the island's most important collection of Cypriot antiquities and treasures from the Neolithic Age to the Roman Period. In contrast to these ancient finds in the State Collection of Contemporary Art, and on the other side of town, just off the main Lemesos road, is the Cyprus Handicraft Centre. Another award winner is the renovated "Pyli Ammochostou" - Famagusta Gate - one of the original entrances to the old city, which won the Europa nostra award for its restoration. Many old churches are to be found in this part of the town, and other places of interest are the Folk Art and Byzantine Museums, the Archbishopric, the Cathedral of Agios Ioannis with its beautiful frescoes, the National Struggle Museum and the intriguing house of Chatzigeorgakis Kornesios- a fine example of 18th century architecture- which houses the Ethnological Museum. Not far from these monuments is the infamous "Green Line" that divides the Republic from the illegally occupied area to the north. It has been in existence since 1974 when Turkish troops invaded the island and claimed 37% of Cyprus as a breakaway pseudo-state that has since been recognised by no nation, other than Turkey. The modern city has developed outside the walls in a cosmopolitan centre of business and culture. 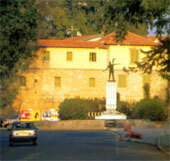 Lefkosia is regarded as the shopping heart of Cyprus, with a variety of restaurants, discos and bars. Within easy reach of the capital are such historic gems as the 12th century painted churches of Asinou and Agioi Apostoloi at Pera Chorio Nisou, the regal tombs at Tamassos, the ancient city-kingdom of Idalion and the enchanting villages of Fikardou and Kakopetria.